Our facilities are available for both religious events such as Weddings, Baptisms and Memorial Services, as well as community events, including classes, AA Meetings, Scout Troop gatherings and providing space for non-profits and community organizations. For a tour, pricing, or to book an event, please contact our church administrator. Eastburn Hall is a multi-purpose area, seating approximately 175 for meetings. It is a warm and inviting place that has a curtained stage, plus an adjacent, comfortable lounge for informal group meetings, or opened to have easy flow between spaces. With its high-vaulted ceilings, large windows, a Yamaha console piano, a projection system and a large drop down screen, the hall can be used for meetings, weddings, banquets. To facilitate events serving food the hall is connected to a spacious kitchen. Kitchen: Well-equipped to prepare snacks for a small meeting, or a fully-catered meal. Play Area: Perfect for family functions or birthday parties. Some events have used tents or fabric "walls" to expand their event into the playground to create an "outdoor room". Front Outdoor Patio: Excellent for family reunions or a refreshments break. The patio is surrounded by beautiful landscaping and shaded by oaks, a ginkgo tree, and other flowering trees. Hidden Garden: Lovely retreat for a small gathering or break-out sessions from a larger group meeting. Weddings at Epiphany are festive affairs! 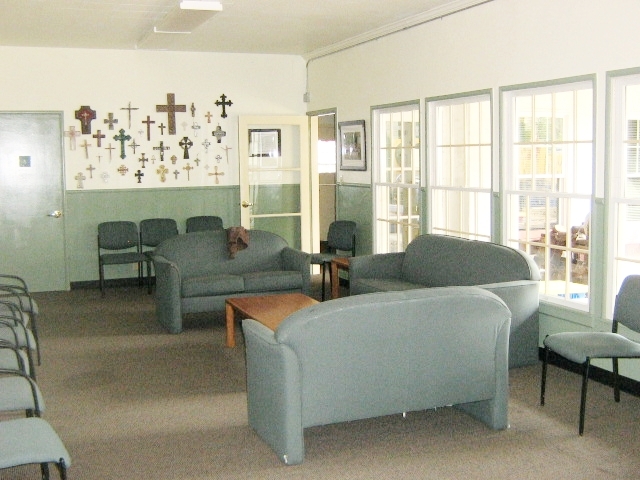 Our lounge is between the parish hall and the outside garden/playground area. Our recently-remodeled kitchen with dual stoves is available for meal preparation for events or a base for event catering. The church, built in 1947, has hosted beautiful weddings, concerts, and other events over the last 80 years. In addition to the full sanctuary, a small chapel is adjacent.